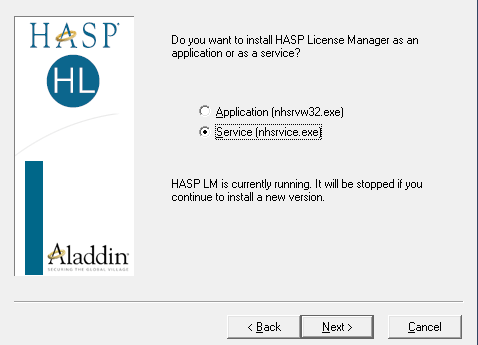 " No active network dongle server (HASP Licence Manager) was found. Vectorworks will now quit." check to see if the license manager is running is running on the machine that has the dongle plugged into it. These steps should also be taken before further troubleshooting. In the upper right-hand corner you will see a drop down (may currently be set to show "My Processes"), set it to show "System Processes." Look for the process listed below in the screenshot. Right-click on a blank spot on the task bar (bottommost bar on the screen) and then left-click on Start Taks Manager. Alternately you can hold down Ctrl+Alt+Del and then click on Start Task Manager. In the Task Manager click on the Processes tab. Be sure to have "Show processes for all users" checked in the lower right-hand corner. Search for the process listed below in the screenshot. Note: Be to select the installer as a service and not an application as shown below. For the latest drivers and license managers from Safenet, click here.